In our recent post, Get the Most Bang for Your Resale Buck with These 3 Easy DIY Projects, we looked at refinishing your cabinets, creating storage space, and framing the bathroom mirror. If that got you motivated, then let’s keep at it! 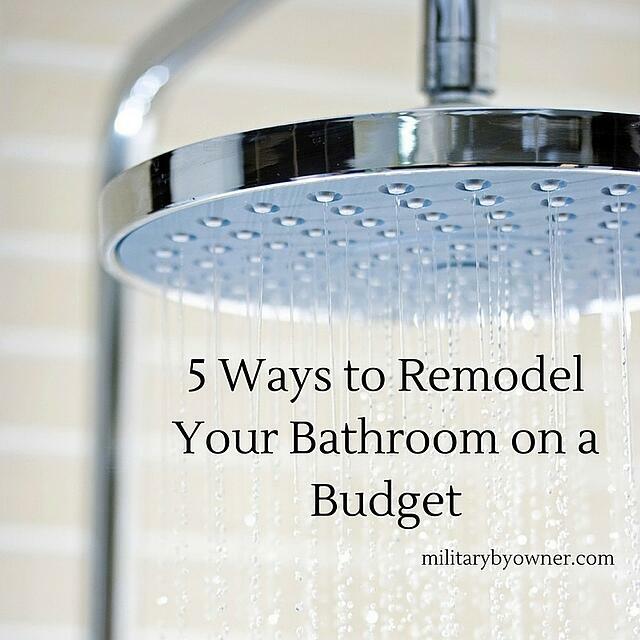 In this post, we’ve got five easy ways to remodel your bathroom on a budget. Take a look and see what you think about these simple updates! 1) Upgrade the water fixtures. It’s a little more work, but for just a couple hundred dollars you can upgrade your outdated shower, tub, and sink fixtures to a modern look that creates a custom, elegant feel in your home. Increasingly, homeowners are switching out chrome for oil-rubbed bronze and brushed nickel. More matte finishes, darker colors, and larger fixtures take center stage now, but the key with upgrading water fixtures is choosing ones that complement your home. 2) Upgrade the light fixtures. Do you still have the big, construction-grade, Hollywood light bulbs in your bathroom? They may look good in Hollywood, but not so much in your home. For only about $50, you can easily achieve an updated bathroom look by replacing the light fixtures, but if you’re crafty, you can do that for even less. A quick search through Pinterest will yield countless options for fabric light shades that you can custom create to match your home’s style. You can’t get much cheaper with remodeling than paint. For about $40, you can purchase the paint you need (with primer), painter’s tape (necessary! ), a brush, and paint tray, and in one afternoon your bathroom can achieve a calming spa-like, seafoam green color. If you’re stuck for ideas, House Beautiful has 50 great (and crazy!) styles to help spark your inner paint muse. We discussed recently how you can refinish the cabinets in your kitchen. After you see how great they can look for so little, you won’t want to stop there. For around $150-250, you can refinish your bathroom cabinets to modernize the look to an espresso, grey, or bright country white look. Watch out laundry room; you’re next! 5) Or just switch out your linens! It isn’t exactly remodeling, but regular PCSing can really wreak some wear and tear on your fixer-upper spirit. If you’re bored of your bathroom and your fixer-upper spirit is taking a break until the next duty station, then switching out your linens may be the simple ticket you need to brighten up your bathroom. Target, Costco, HomeGoods, Marshalls, and the Exchange all have inexpensive linens that will freshen up your bathroom look. Select neutrals or bright whites for your bath towels, bath mats, hand towels, and face towels, and accent with an additional seasonal hand towel to help your bathroom feel new all year round. If you've tackled any of the above projects, share them with us! We can't wait to see what you've done! Want more helpful tips like these? Click below to subscribe to MilitaryByOwner's monthly newsletter.